Both the Washington House and Senate have voted to name U.S. Highway 395 (in red) after the late Speaker of the House Tom Foley. The Washington legislature has voted to name U-S Highway 395 in eastern Washington after the late Speaker of the House Tom Foley. The Washington state Senate gave its approval yesterday (Thursday) — after the House has already done so — and sent the bill to the governor. 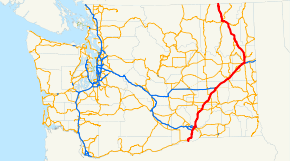 The highway runs from the Canadian border through Spokane and Ritzville down to the Tri-Cities. Supporters credit Foley for securing federal money to turn the Ritzville-to-Tri Cities link into a modern four-lane highway. Spokane Republican Senator Michael Baumgartner praised Foley and said the move to name the highway after him is appropriate. But he tried to amend the bill to name part of 395 after Foley and part after Spokane native Sam Grashio. Grashio was an Army Air Corps pilot during World War II who was captured and held prisoner by the Japanese, until he escaped. Grashio died in 1999. “I would like, in a bipartisan way, to honor a war hero that people are forgetting, in addition to a person like Tom Foley. I don’t know why we can’t do both of these together. It would be disappointing, to say the least, to see this pushed through this way,” Baumgartner said. Lake Stevens Democratic Senator Steve Hobbs said his measure was already approved by cities and towns along Highway 395. He offered to help find another stretch of road to name after Grashio. Baumgartner’s amendment was defeated by one vote. The memorial to name the highway after Foley sailed through by a 40-to-seven margin. It now goes to the governor for his signature.